On this and three other pages we'll show all the cards that we've already shown on Facebook in one of the groups about playing cards. We have limited the shown number of cards, not only because we fear illegal copying and printing, but also because we are thinking of publishing a reproduction of this deck. There are enough collectors who can appreciate transformation decks to justify a limited edition and an actual reproduction is always better to have than shared pictures on a screen. We've only just started the process of researching. 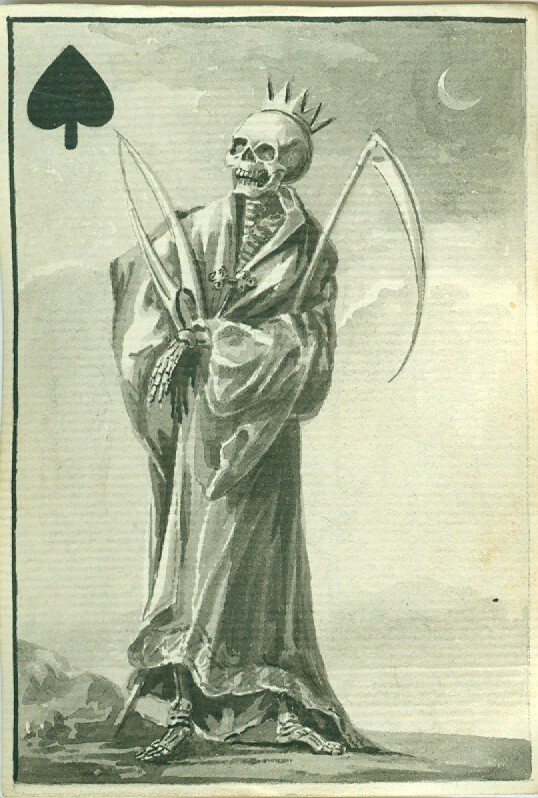 We'll work our way through the book about transformation cards by Field, just to see if we can find cards that have been copied or used as inspiration. 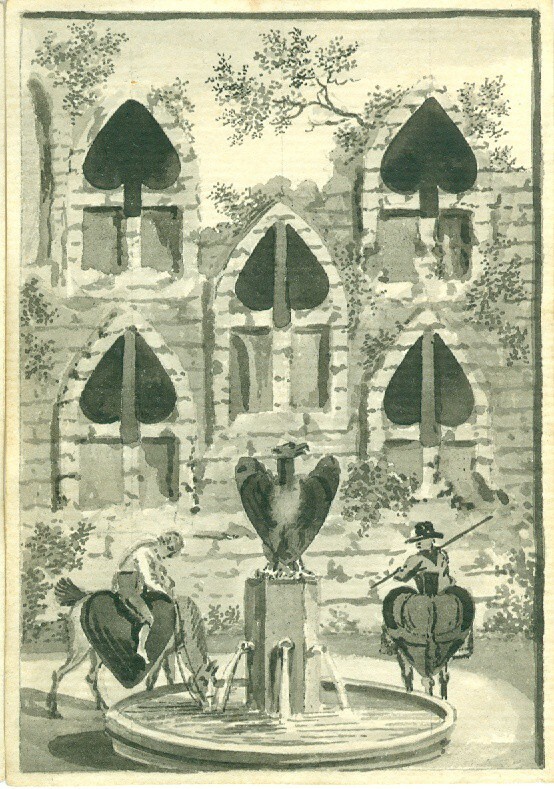 The 8 of spades has already been spotted as a scene from the Cotta deck from 1805. Besides that we'll contact some experts from museums about the clothing of the jacks and maybe other ways to determine the age. There's little doubt here about the origin of the deck. 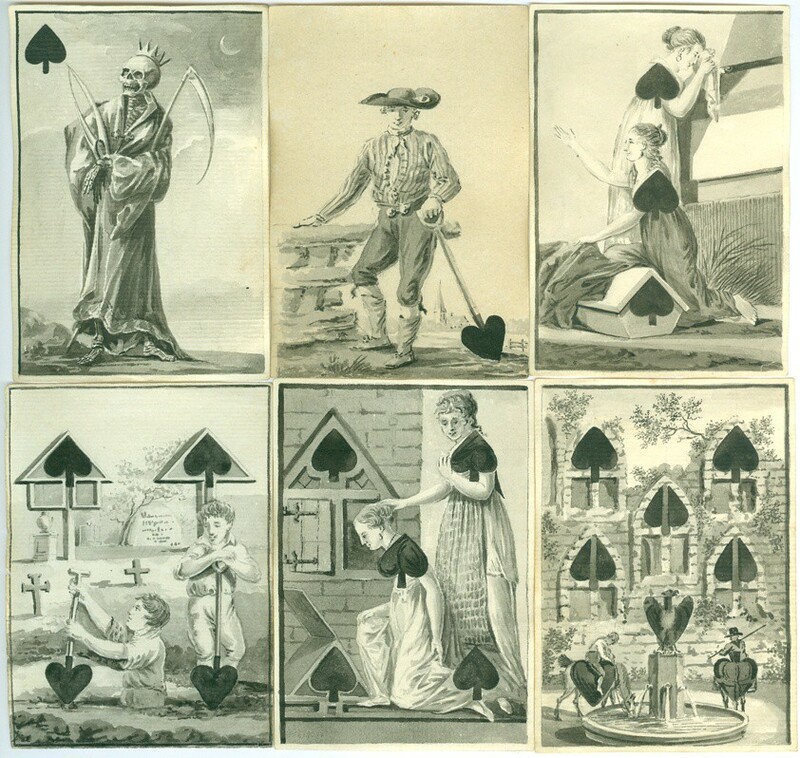 A few cards show the Dutch flag and the King of Hearts shows a famous Dutch admiral, Michiel Adriaenszoon de Ruyter. So we've concluded that the deck must have been made in the Netherlands. In that case it will be the oldest and probably the first Dutch deck of transformation cards. We have enlarged some cards and details to show the craftsmanship of the artist. The large tombstone on the 4 of spades looked promising as a place to find a name or date, but enlarged it was a disappointment.